Truth, something Democrats cannot stand. No one wants to explain what is ‘better’ about paying more, and getting less. Democrats government rationed healthcare, summary … Kill granny, save money, give money saved to Democrat constituencies, get elected for life. Ask trial lawyers and Hugo Chavez for details. Sort of like generating electricity with windmills, or driving your car on ethanol. All cost more for less. State Assemblywoman Dede Scozzafava (R) announced on Saturday she would suspend her campaign to fill former Rep. John McHugh’s open House seat, citing dismal poll numbers just days before the much-hyped special election. Her exit from the race offers serious momentum to Doug Hoffman, the Conservative Party candidate who has stolen from Scozzafava a slew of important GOP endorsements and donations in recent weeks. You look down America, have a sucker on me. 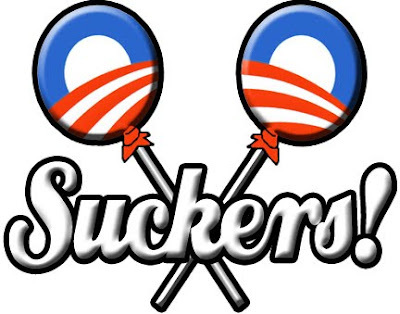 Recommended Reading: Obama Lied; The Economy Died – Commentary by Tony Blankley. Is it now time to admit, the Obama administration is evil? I forgot, didn’t they already do this? So expect for using find and replace on the crap in your other bill, HR3200, how does this improve healthcare for Americans? Oh Government rationed Healthcare is changed to the “Consumer Option” … LOL. The Democrats think you are all fools. Democrats in the House of Representatives finished work on Wednesday on a healthcare bill that includes a government-run insurance plan, requires individuals to buy health coverage and imposes a surtax on the wealthy to help pay for it. The measure, the product of weeks of closed-door talks to merge three pending health bills, will be unveiled by party leaders on Thursday and submitted to the full House for debate as early as next week. The bill includes a government-run “public” insurance option that uses reimbursement rates negotiated with healthcare providers, Democrats said, a setback for House liberals led by Speaker Nancy Pelosi who favored a more “robust” version to compete with private insurers. Pelosi failed to gain the 218 votes needed to pass a version of the government-run plan using lower rates pegged to Medicare, the health plan for the elderly. The healthcare measure being prepared for debate in the Senate also includes a public insurance option based on negotiated reimbursement rates but, unlike the House bill, it would allow states to decline to participate. The House’s version of a sweeping healthcare overhaul, President Barack Obama’s top domestic priority, would require individuals to buy insurance and all but the smallest employers to offer health coverage to workers, Democrats said. It would offer subsidies to help the uninsured buy insurance through newly created exchanges and would expand eligibility for the Medicaid program to those with incomes up to 150 percent of the poverty level. Of course it’s Reuters, not known for getting it right, so take your chances for now. The state-run media insists that the majority of Americans want government to takeover the health care industry with a public option plan. Hey Taxpayers, How Is That GM Bailout Working For You ? Not so good huh? Well it wasn’t a real bailout, it was a handout to the unions, so some solstice is deserved. GMAC the lender that received two government bailouts totaling $13.5 billion, is negotiating with the Treasury Department for a possible third lifeline next month. The U.S. is studying a capital injection of $2.8 billion to $5.6 billion. GMAC probably needs less than the maximum because conditions have improved and are less dire than envisioned. GMAC may get more government money because the Obama administration regards GMAC as crucial to the survival of the U.S. auto industry. General Motors Co., its former parent, and Chrysler Group LLC rely on the firm to finance their customers. GMAC will report third-period results on Nov. 4, after loses in seven of the last eight quarters. So what’s the bet, turnaround? So like with AIG GMAC is used as a funnel to add support to the dying patient, GM. The problem with government sinkholes is they never seem to get filled in. Complete with screenplay and fine music as the assisted suicide doctors come in … It’s the scene from Soylent Green that was key to leading police officer Robert Thorn (Charlton Heston) to the fountain head of the mystery, where does Soylent Green come from? Elderly police researcher Sol Roth (Edward G. Robinson) figured out Soylent Green, it’s people, and decided to die instead of reveal the secret. The future form of assisted suicide? From the film ‘Soylent Green’ — Charlton Heston’s tears at Sol’s death were real, as Heston was the only cast member who knew that Edward G. Robinson was dying of terminal cancer. This was the 90th and last movie in which Robinson appeared. He died nine days after the shooting was done, on January 26, 1973. The “going home” score in this part of the film was conducted by Gerald Fried and consists of the main themes from Symphony No. 6 (“Pathétique”) by Tchaikovsky; Symphony No. 6 (“Pastoral”) by Beethoven; “Morning Mood” and “Åse’s Death” from the Peer Gynt Suite by Edvard Grieg. We may get there yet … Obamcare has all the characteristics. When you are no longer productive, do the right thing for the greater good. If this gives you the creeps, it should. You are currently browsing the Tarpon's Swamp blog archives for October, 2009.